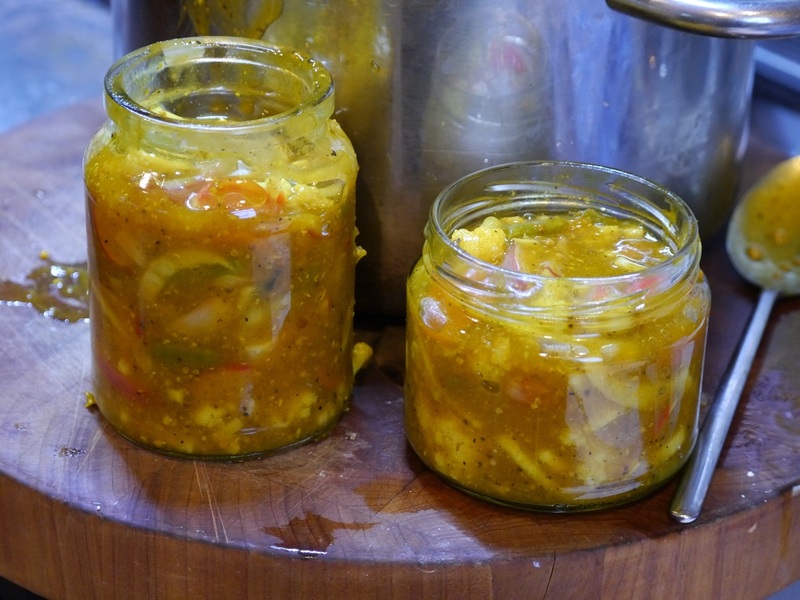 I started on a mission to make a few jars of pickles to have in the cupboard at home as we’d run out and they’re always great have. I went completely overboard and in the last two weeks have pickled lots of different vegetables and fruit. The last lot was yesterday! Mike then suggested I fill a selection of very large jars for decoration on the kitchen shelves here at La Cigale. 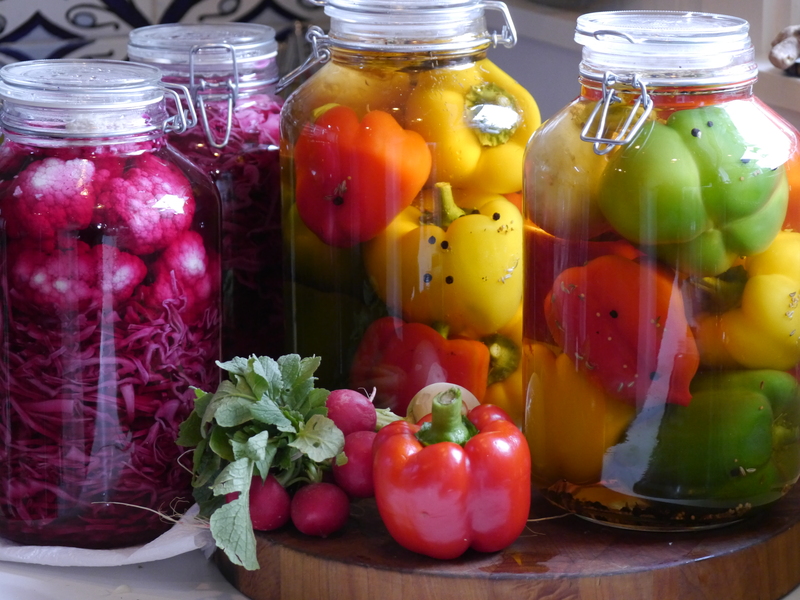 I’ve gone through litres of vinegar and boxes of vegetables and ended up with a great selection of pickles. Pickling has been around for a long time as a way to preserve food so I decided to consult the pickle recipes in my 1899 copy of Mrs Beeton’s ‘Book of Household Management’. Nothing much has changed!! It has recipes for pickled red cabbage, baby onions, gherkins, mixed vegetable pickle which she calls Indian Pickle, capsicums, beetroot, mushrooms and lots more. One of the more unusual ones that I won’t be trying is the recipe for 100 pickled oysters but one that looks intriguing is for pickled nasturtium pods which said to be a substitute for capers. I’ll be able to harvest some pods from the nasturtiums in our garden. So after consulting Mrs Beeton, my 40 year old notebook of my favourite recipes copied from my mother’s old recipe book and a few other books, I started pickling!! Included are red cabbage, green beans, fennel, onions, shallots, cucumbers, radishes, daikon radish, turnips, white, green and purple cauliflowers, capsicums, oranges and more. 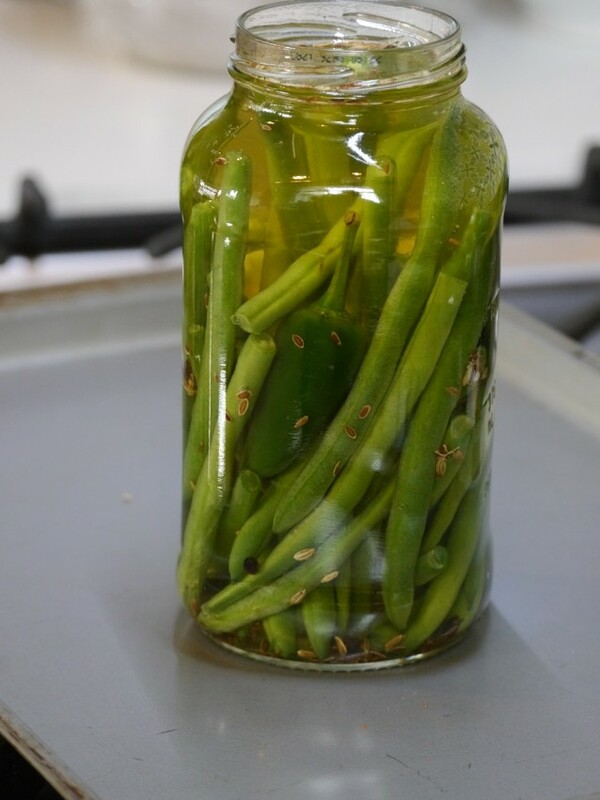 I used the same basic formula for most of the pickles – 4 parts vinegar, 2 parts water, 1 part sugar. I used white wine, red wine and cider vinegars according to what I was pickling. I made sure I sterilised my jars and lids properly and in most cases I heat sealed the filled jars. 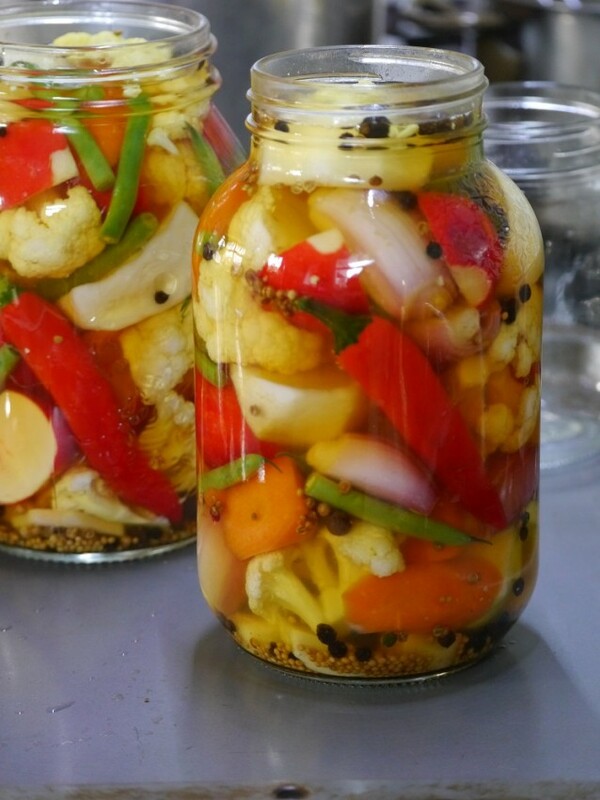 To do this you fill sterilised jars with the vegetables, pour in the vinegar mix and spices leaving a small gap at the top then put the lids on. You then put a folded teatowel or similar in the bottom of a large pot, sit the jars in (not touching each other) and fill the pot with water up to a level just below the jar lids. Bring the water to the boil and keep it boiling for 15 – 30 minutes depending on the size of the jars. Tighten the lids and as the jars cool the lids should seal. Place the sliced cabbage in a dish, sprinkle with salt, cover and leave overnight. If you can weight it, do so as it helps to draw out the moisture. The next day rinse the cabbage, drain in a colander and pat dry with paper towels. Bring the vinegar, water and sugar to the boil, stirring until the sugar dissolves. 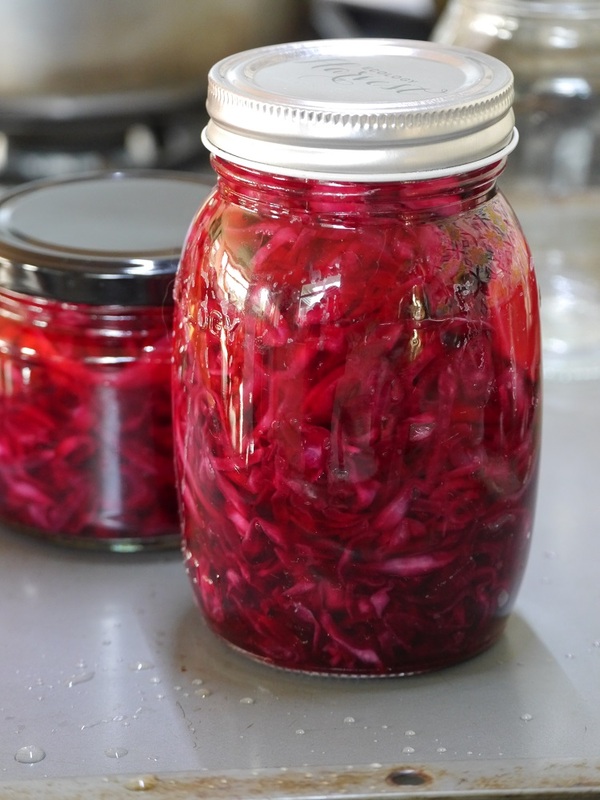 Pack the cabbage into jars including in each some black peppercorns, a piece of ginger and a clove of garlic. 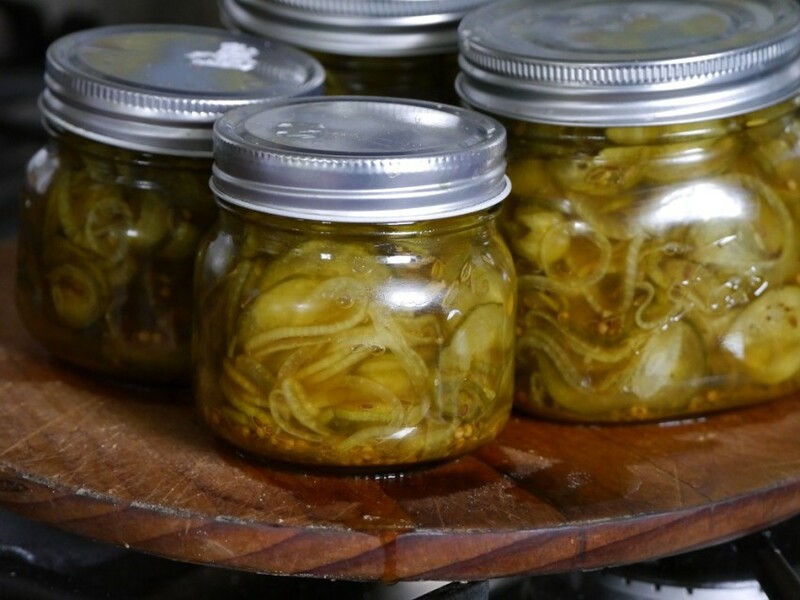 Pour in the hot vinegar pickling mix and put on the lids. Put the oranges in a pot, cover with water and add the salt. Simmer for 15-20 minutes. Drain and when cool enough slice the oranges into thick slices. Place the rest of the ingredients in a pot and bring to the boil. Simmer for 4-5 minutes. 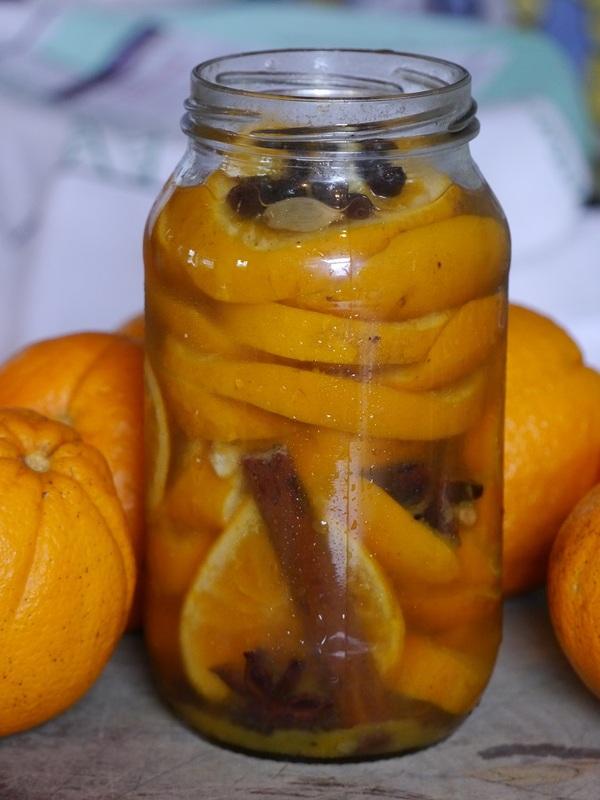 Place the orange slices in a sterilised jar and pour over the hot pickling liquid. Leave to cool and screw on the lid. There’s no need to heat seal this as you keep it in the fridge. If you can resist temptation leave the oranges a week before use. This is delicious with cheeses, roasted duck, chicken, smoked fish and also on top of ice cream. For our large display jars I kept the oranges whole. 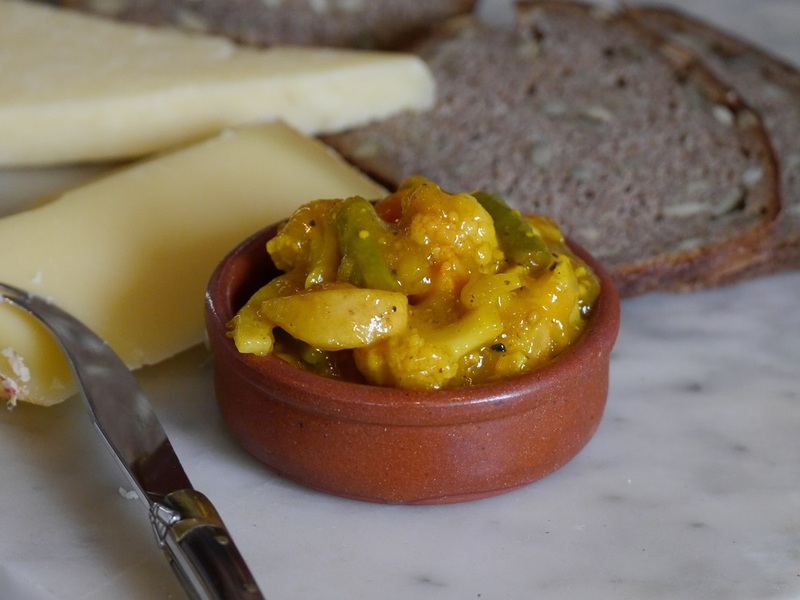 It seems that everyone loves Piccalilli particularly on sandwiches and with cheese. Adjust the ingredients as you like, keeping cauliflower and carrots and changing round other vegetables. In a bowl mix together the cornflour, ground spices, salt, whole mustard seeds, mustard powder and turmeric. Bring the vinegar, water and sugar to the boil stirring to dissolve the sugar. Pour a little of this hot mix into the cornflour mix and stir to get rid of any lumps. Then pour all of this mix into the hot vinegar on the stove stirring as it thickens. It will become a thick glossy sauce. 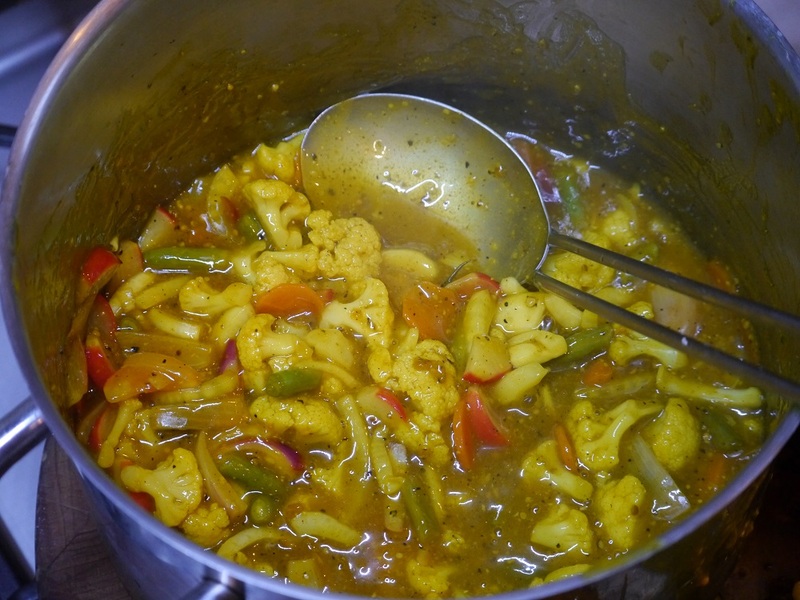 Add all the vegetables and stir to make sure all pieces are coated with the piccalilli sauce. Spoon into jars and heat seal.